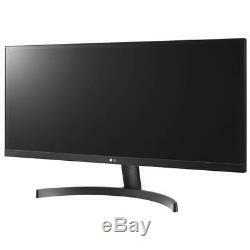 LG 29 29WK500-P LED IPS LCD Monitor Dual HDMI UltraWide 21:9 AMD FreeSync. 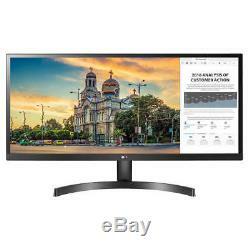 21:9 UltraWide Full HD IPS Display 2560 x 1080 Resolution FreeSync Technology sRGB 99% Color Gamut OnScreen Control Screen Split Black Stabilizer Game Mode Reader Mode -5 to 15 Tilt Angle 2 x HDMI 1M:1 Contrast Ratio 5ms GTG Response Time 250 cd/m Brightness. 29-inch Class 21:9 UltraWide Full HD IPS LED Monitor. Stand: Tilt (Angle): -515 Degree. 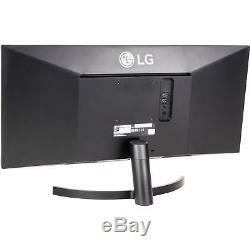 VESA size (mm): 100 x 100 (VESA compatible). Color Gamut (CIE1931): sRGB 99% Typ. Color Depth (Number of Colors): 8bits (6bit+FRC), 16.7M. Pixel Pitch (mm): 0.2628 mm x 0.2628 mm. Response Time (GTG): 5ms (High). 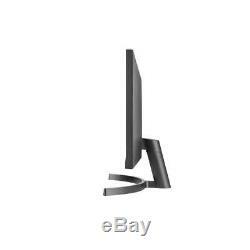 Brightness: 250 (Typ), 200 (min) cd/m2. Contrast Ratio: 1000:1 (Typ), Mega. Picture Mode: Custom, Reader, Photo, Cinema, Color Weakness, FPS1 Game/FPS2 Game, RTS Game, Custom (Game). Ratio: Wide, Original, Cinema1, Cinema2. PIP: PIP mode in Screen Split. Screen Split 2.0 (in OSC). My Display Preset (in OSC). Input: 100 - 240V, 50/60Hz, 1.0A. 16.2 x 27.5 x 8.2-inches (H x W x D). 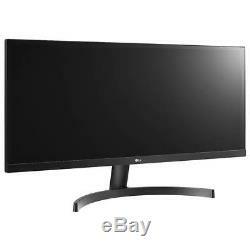 29 29WK500-P Dual HDMI 2560x1080 UltraWide 21:9 LED IPS LCD Monitor. Transit time varies and vary by carrier, we cannot control delays caused by carriers. Also subject to change especially during peak periods. (unless stated otherwise in the listing). Defective items may only be exchanged for the same title.